I have four older red knock-out rose bushes that have been blooming normally until this year. This spring, they bloomed mostly with pink blossoms, but also a few red ones. Then, the buds didn't develop fully, almost like there were only several very tiny petals in each tiny bud. These never opened. Now, they aren't making any buds. Please tell me if you know what happened! Well it could be several things.The first place I always start is to check the soils pH level and see if things are out of wack there. If that is not it then perhaps there is some deficiency in the nutrients available for the rosebushes to take up. 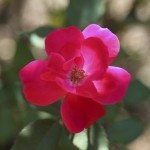 Using a good organic rose food will help to balance things out with the nutrients available. Also if the pH is out of wack it will lock up nutrients in the soils even if they are there and the rosebushes cannot take them up. There could also be problems with funguses if the weather where you are has been damp or rainy, some funguses will really take a toll on the rosebushes and cause such things as no blooms and strangely formed buds and blooms. Spraying the rosebushes with a good fungicide a couple of times 7 to 10 days apart will usually get the fungal attacks under control. There are insects such as thrips that will attack the buds and they will not open and bloom or will do so and be disformed. 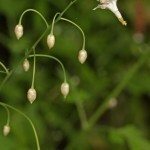 If it has been extremely hot where you are, it can be hard for the root system to get all the moisture and nutrients out to the buds, thus they either do not form at all or are poorly formed and any blooms are unusual as well. 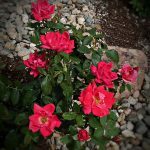 The heat stress can take a toll on the rosebushes. Keep them watered and well fed. Give them some Super Thrive mixed in with some root stimulator in a watering can. This will help with stress relief. I am mentioning several things here so you can kind of check them all out to see what might be going on. There are alot of variables to performance such as you describe.